Author Joe Vitale's previous book, Zero Limits, presented a unique self-help breakthrough focused on helping overworked, overstressed individuals overcome obstacles and achieve their goals. It was the first book to explain how a secret Hawaiian method called ho'oponopono can help people experience health, wealth, happiness, and more. It empowered thousands of readers to take control of everything in their lives in order to achieve all they’ve ever dreamed of. At Zero starts where Zero Limits left off. It offers new stories, explains new process, and reveals the fourth stage of awakening. Life will always present you with challenges. The practice of ho'oponopono, as revealed by author Joe Vitale, guides you through the journey of life with the tools you need to rid yourself of hindrances and open yourself up to infinite possibilities. 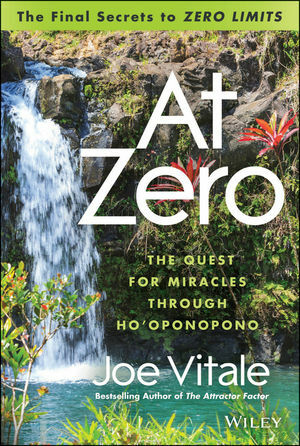 JOE VITALE, globally famous author, speaker, musician, healer, and movie star, is an authentic practitioner of modern Ho'oponopono. He is also a certified Reiki healer, certified Chi Kung practitioner, certified clinical hypnotherapist, certified NLP practitioner, ordained minister, and holds a doctorate in metaphysical science. He is author of the bestsellers The Attractor Factor, Life's Missing Instruction Manual, and many more, including Zero Limits (with Dr. Hew Len), The Awakening Course, Hypnotic Writing, and The Key, all published by Wiley. Dr. Vitale is a standout star in the hit movie The Secret. He's the creator of Miracles Coaching®. His main website is www.JoeVitale.com He lives outside of Austin, Texas.